Rock, pop, classic, acoustic and electric guitar, piano, keyboard and vocals… Anthony Phillips is good at that and many things besides. He has proved his abilities and broad repertoire on more than twenty records under his own name. ‘New fans’ who would like to get to know his music usually find it difficult to pick an album to start from such a number of albums. 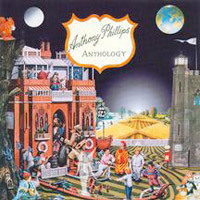 In 1985 Anthony Phillips released a compilation album called Harvest Of The Heart that consisted of material from the first four Private Parts & Pieces albums, but Ant has written lots of new material since then and, besides, Harvest Of The Heart was released on vinyl only and is quite difficult to find. A solution to all these problems has now been published. The Anthology album presents a carefully chosen selection of Ant’s career and music. Classics such as Um & Aargh, Prelude ’84, God If I Saw Her Now or The Women Were Watching are included as well as more recent pieces (e.g. Unheard Cry or Tears On A Rainy Day). It is difficult, of course, to find a selection of songs that everybody likes, and some fans may therefore miss their favourite Anthony Phillips songs on this compilation. It may be noted that the previously ultra-rare Anthem From Tarka (single mix) was included instead of an extract from the Tarka movements. For Lights On The Hill the instrumental version from PP&P 4 was used. It would have been nice to hear the hitherto unreleased version with vocals called Walls & Bridges on the Anthology. Walls & Bridges is one of the songs from the 1984 musical Alice Ant wrote the music for. There are, alas, no completely unreleased pieces on the album. Such a bonus track could have been an additional incentive to buy this release, but everybody, be they a fan or a newcomer, should have this album. The booklet and the design itself are remarkable pieces of art themselves. It is another job well done by Helmut Janisch who already designed the lyric book. The front cover is a feast for the eyes! It is a collage from various elements (animals, people and other objects) from previous cover artworks by Peter Cross based on the Private Parts & Pieces cover. Wholly new is the coat of arms Peter Cross designed especially for the Anthology. The rear is another collage, consisting – obviously – only of elements from the back of various Anthony Phillips albums. Inside the booklet there are remarks on the pieces as well as an informative text about Ant’s career that completes this great release. Never before has it been so easy to get to know the musical world of Anthony Phillips as with this album.